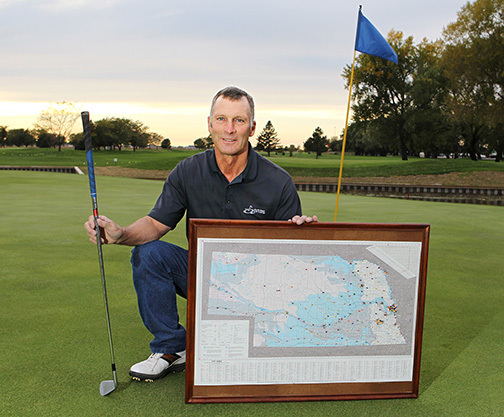 Dave Marxsen used a map and pins to show all 252 Nebraska golf courses he has played. He finished his final course in September. There are approximately 233 golf courses in Nebraska. Dave Marxsen has played 252 of them. There’s been a few courses close since Marxsen has started keeping track – hence the number discrepancy – but as of Sept. 17, Marxsen has played every golf course in Nebraska. Marxsen, 57, began his quest to play ‘em all about 20 years ago. He picked up the game when North Bend built its golf course in 1995. After a while, he decided to look for a new golfing goal after discarding the goal of having low scores. He heard about another person who had played every course in the state. Someone gave him a book that listed and described all the Nebraska courses. So he began checking them off, one by one, penciling in new courses in the margins that opened up since the book’s 1998 publication. He also kept track by sticking pins into a map of Nebraska marking the courses he’s played. His first serious step toward his goal involved a trip to the northeast where he hit up Wakefield and Pender. After spending the night at Ponca State Park, he played Ponca, Hartington and Laurel the next day, some of it in the rain. His work schedule at ADM in Columbus gave him random days off, which helped him hit courses that were relatively empty in the middle of the week. That also meant he usually went alone. At first he was only doing the courses listed in his book. Then he saw a listing of sand green courses in the Omaha World-Herald that weren’t in his book. “I thought, well, if I’m going to play all the courses, I got to play the sand green courses, too,” he said. He had already hit up most of the courses in the far western part of the state. But now he had to return to hit the sand green courses he had previously skipped. Sometime he’d show up at a bad time, maybe while the course was closed for a tournament or scramble. His story would help open doors. Some of the big and exclusive courses toward the end required connections and months of planning to get a tee time. “You knew you better be ready to play in the rain because you’re not going to spend another two months trying to get lined up to play again,” Marxsen said. He entered 2016 with just a handful of courses left. A five-hole sand-green course near Valparaiso. Lincoln Country Club. Dismal River. Tatanka Golf Club. By this time family and friends wanted to tag along and help him finish up. Sometimes strangers he met at the course would come cheer him on as he teed off. He planned to finish his journey Sept. 17 at Tatanka near Niobrara, a relatively new course. A party of eight friends and family accompanied him. A week before the big day, Marxsen heard about a course he had missed in Petersburg, a four-hole course in the city park there. So the group swung by Petersburg and played four holes on its way up to Tatanka. He’s driven through a lot of beautiful land as he visited all corners of Nebraska. He’s met a lot of friendly people along the way. He even hit two holes-in-one. His game has gotten better with all the practice, he said, but some of that has been canceled out by the 20 years of age he’s added during his adventure. However, he also admits it’s not really over. There’s a new course being built up near Valentine. “We’re already making plans to go up there next year,” Marxsen said.